Fifty Games at Chess which have actually been played, most of which occurreed between the author and some of the best players in England, France and Germany; to which is added Some Account of the Village of Stroebeck, in Germany. By William Lewis, W.Simpkin and R Marshall, London 1832. A Selection of Games at Chess played at the Westminster Chess Club, between Monsieur L.C. de la Bourdonnais and an English Amateur of first rate skill, arranged with remarks by William Lewis. W.Simpkin and R Marshall, London 1835. The two books are bound together in black cloth covers with title label "CHESS" on spine. These two works were advertised by the publishers as being available in one volume. See the advert leaf. 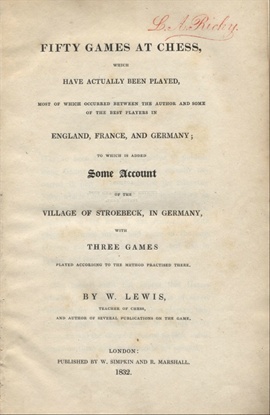 The first book contains fifty games, mainly played by Lewis, a seven page account of the author's visit to Stroebeck in 1831 and three games played there. 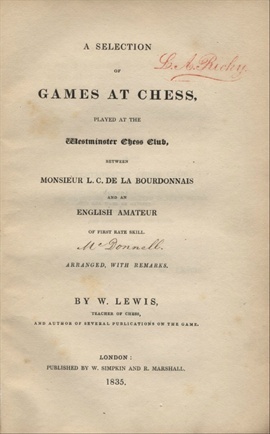 The second book includes fifty games played in the de la Bourdaonnais v McDonnell match although Lewis states that he is not at liberty to name the English Amateur. Many games in this book have been heavily annotated in a very neat hand with Lewis's own notes taken from The Chess Player's Chronicle. See the Notice page and sample pages. Both books have page headings "Fifty Games at Chess"
A chess article from Bell's Life, 1843 is pasted inside the rear cover. See further photos on sub-page.